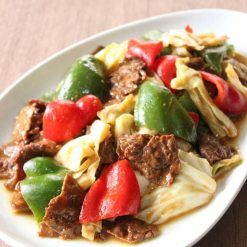 Enjoy our popular Soy Meat with Chinese Pork Sauce, which is 100% free of animal products, additives, and preservatives. 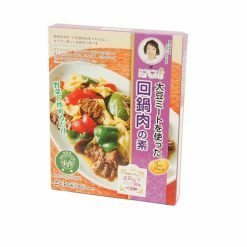 The soy meat comes in an easy-to-use pack with twice cooked Chinese pork sauce. Mix the sauce with tofu to prepare a 100% vegetarian and delicious spicy curry. No additives or preservatives are used making this a healthy choice for your body. The dish is recommended to vegetarians and vegans by Japan Vegetarian Society. No garlic is used, so there is no need to worry about bad-breath after your meal. The recipe was developed under the supervision of renowned vegetarian chef, Izumi Shoji. Spread vegetable oil in frying pan, cook bite-size cut cabbage on high heat. Add pack to cabbage and cook again.